ARIANA GRANDE LIVE IN MANILA - I Blog, Therefore I Am. I was very fortunate that I was able to watch the Ariana Grande concert last August 23 at the Mall of Asia Arena. 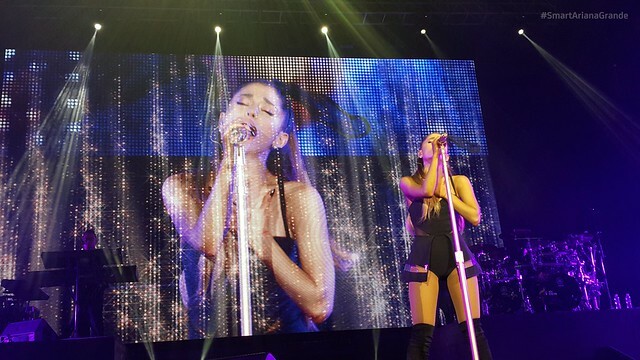 I covered Ariana's Honeymoon Tour Manila for Smart and Spinnr's social media. The production and the costume and outfit changes were not as extravagant compared to recent Philipine concerts of Katy Perry, Taylor Swift, and Lady Gaga, but Ari compensated it with her amazingly powerful singing voice and awesome dance moves. Ariana started the concert with 'Bang Bang' and ended the night with an encore of 'Problem'. She had three outfit changes and sang 17 songs from her 'Yours Truly' and 'My Everything' albums. Arianators were also treated to her iconic 'cat ears' all throughout the show. Here are some of the videos and photos we took from the concert. Check out Smart and Spinnr's Instagram, Twitter, and Facebook or hashtags #SmartArianaGrande and #SpinnrArianaGrande for exclusive photos and videos of the Ariana Grande Honeymoon Tour Manila. Here's Ariana singing soulfully 'Tattooed Heart'. This is one of my favorite performances of the night. My favorites are her performances of 'Bang Bang', 'Tattooed Heart', 'One Last Time', 'My Everything', and 'Break Free'. She also gave a very solid performance of 'I Have Nothing' as a tribute to Whitney Houston. Check it out at the video below. Whitney will be proud! All photos and videos were splendidly shot using a Samsung Galaxy Note 4 powered by Smart. Check out my Flickr for more photos.